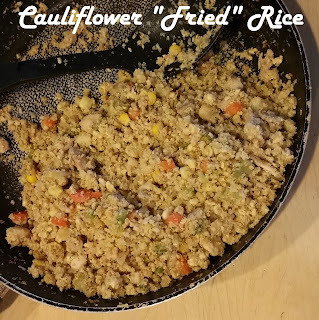 Fit Fluential Mom: Cauliflower "Fried Rice"
I'm a self admitted carb lover and rice is one of my faves.....along with quinoa, couscous and anything with a similar texture. When I discovered cauliflower rice, I was in heaven.... then realizing I can make cauliflower "fried rice" was the icing on the cake! So, here's my recipe that was tweaked by combining a few of the ones I found thanks to the wonderful world of the web! Enjoy! Cut the leaves and core off the cauliflower. Break the cauliflower up into small florets. If you are using a food processor, you can keep the stems on if they're soft. 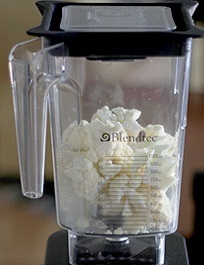 If you're using a good blender (Blendtec or Vitamix), cut the stems off and cut the florets into small pieces. 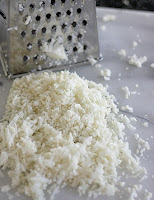 You can also use a hand grater but that's the last resort......it takes forever! Add the florets to the food processor or blender. Process or blend until evenly chopped to a consistency similar to rice but not pulverized. If you're using a blender vs a food processor, add the cauliflower in a few pieces at a time since it tends to get stuck. 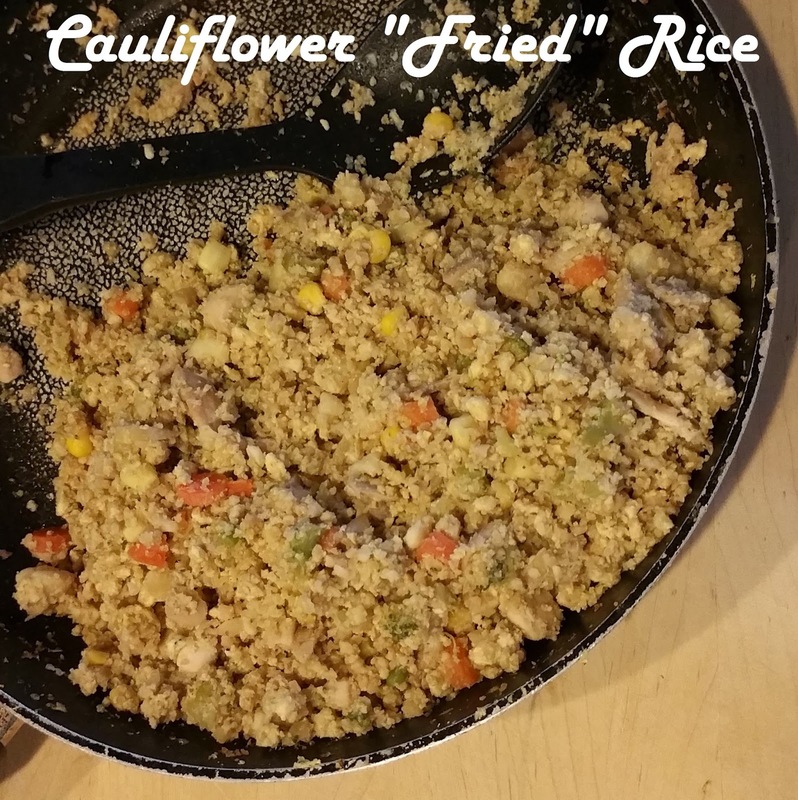 Once all of the cauliflower is pulverized, set aside. Add a small amount of oil (olive, coconut or sesame) to a skillet or wok then add 1 TBSP of minced garlic & brown lightly. I had some rotisserie chicken left over so I chopped some of that up and added that as well. It adds protein and turns a side dish into a meal. You can also add some raw chicken breast and cook it thoroughly during this step if you'd like. Then you can add any blend of veggies you like. All I had in the fridge were some steamed Normandy Blend veggies & Costco's organic veggie blend so I chopped up the two and added them! Most recipes call just for peas, corn & chopped steamed carrots but I love veggies so I added what I had. It included broccoli, cauliflower, carrots, peas, corn & edamame! After adding the veggies, chicken (if you'd like) & garlic, add the cauliflower. Mix it up & cook it for a 5 to 10 minutes. 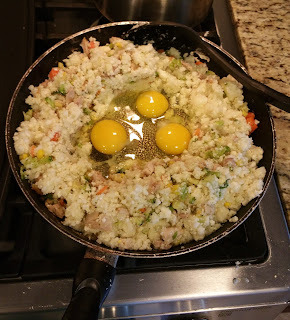 Then spread it aside and add 3 to 4 eggs in the center.Cook the egg thoroughly and once it's cooked, blend together with the "rice", veggie & chicken blend. Add some soy sauce (taste it as you add it to make it to your liking) and cook a few minutes longer. Toss around regularly while cooking it to cook it evenly and thoroughly.